Irish American immigrants cut loose from the familiar surroundings of home were always hungry for the latest news from the old country, as well as news of their former neighbors now spread across the United States. Irish American newspapers helped fill this need, and were subscribed to by Irish Americans across the U.S. and Canada…and these newspapers delivered the news their readers wanted. These Irish American newspapers give us great genealogical details like the name of the townland and county in Ireland where the person was born. The availability of this critical information is why Irish American genealogists are so focused on the old Irish American newspapers. 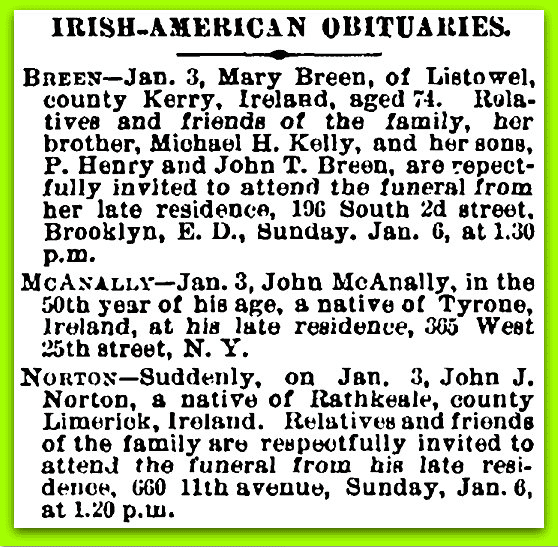 Imagine if the obituaries simply said that Mary Breen, John McAnally and John J. Norton were born in “Ireland.” Readers of Irish American newspapers expected more information than that—and they got it. For example, the Irish American Weekly devoted an entire page to news from every county in Ireland. Irish American Weekly (New York City, New York), 12 January 1889, page 6. News, obituaries, marriages in Ireland—they’re all recorded on these pages. Irish American Weekly (New York City, New York), 12 January 1889. For example: there are passenger lists from Ireland to America in these Irish American newspapers. Irish Nation (New York City, New York), 7 January 1882, page 8. The level of detail provided by these old newspaper passenger lists is important since the immigrant’s home county and destination in the United States is not recorded in the federal passenger lists that genealogists routinely consult. These Irish American newspapers are the only source for these detailed passenger lists. 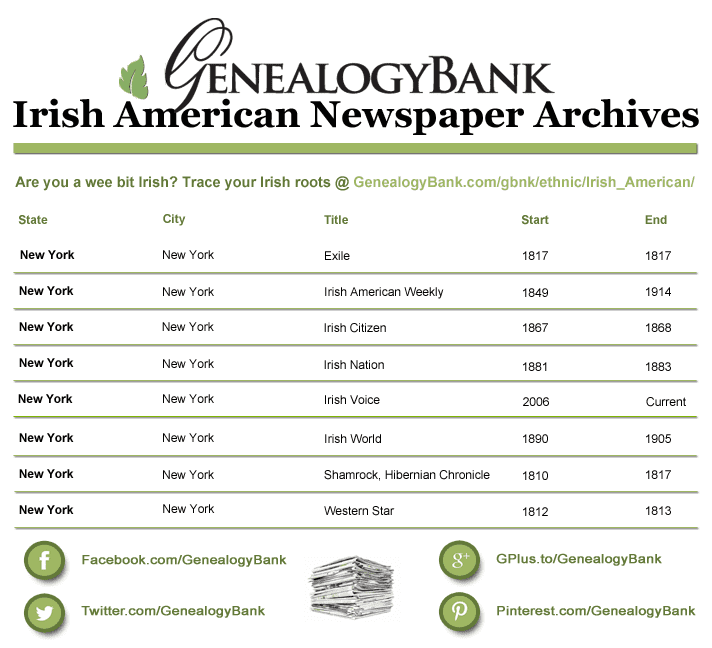 Irish American newspapers are invaluable for tracing your Irish ancestry and GenealogyBank has them! Start searching our special Irish American newspaper archives to discover your Irish roots now. Please note that each one of these Irish American newspapers was published in New York City, but their circulation extended around the country and up into Canada. Feel free to redistribute our Irish American newspaper archives list on your website or blog using the embed code below. My last name is Talbot. My ancestors were from Ireland. I’d like to find info. Dianne- Depending on what research you have already done you would need to know what county the family comes from. Once you have the county you can search church records (if you know the years because some years’ records were destroyed). Another great site for researching your Irish ancestry would be FamilySearch.org. You might also consider Googling “Talbot” to see what results populate.